During an aerial survey of swan nests in eastern Idaho on May 29, TTSS observer discovered a tragic scene on Hossner Pond, 1 mile west of Ashton, Idaho. Three eggs lay abandoned in the exposed nest cup, while the body of an adult swan lay sprawled in the water near the nest. Idaho Department of Fish and Game (IDFG) officers later retrieved the dead swan and collected forensic evidence. Although the killing apparently occurred earlier in May while the female was still laying eggs, evidence was sufficient to prove it had been shot. 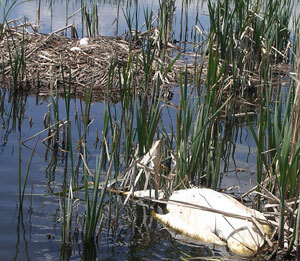 Nesting Trumpeter Swans have been declining in Idaho in recent years. In 2008, Idaho had only 15 nesting pairs and only five cygnets fledged in the entire state. TTSS is leading efforts to increase nesting pairs in Idaho and rebuild a secure population. We will be working with local residents of eastern Idaho and IDFG to solve this crime. Although our funds are very limited and usually spent to improve nesting pairs, we are offering a $500 reward for information leading to the arrest and conviction of the miserable wretch that destroyed this nesting pair. Help us arrest and convict the person responsible and make it abundantly clear that this abhorrent action will not be tolerated. Tips should be called into the IDFG Citizens Against Poaching (CAP) hotline (1-800-632-5999). Please also help us increase the ASHTON, IDAHO, SWAN SHOOTING REWARD FUND. You can donate online or send a check to our office and direct that it be used for the Ashton, Idaho reward. Any donated funds are tax deductible and will be paid out through the CAP system for information leading to the arrest and conviction of the criminal. We will keep donors informed of developments. If the crime remains unsolved, your contributions will be used to benefit nesting swans in Idaho.